Mayor Richard Moccia, left. Common Councilman Matt Miklave, right. 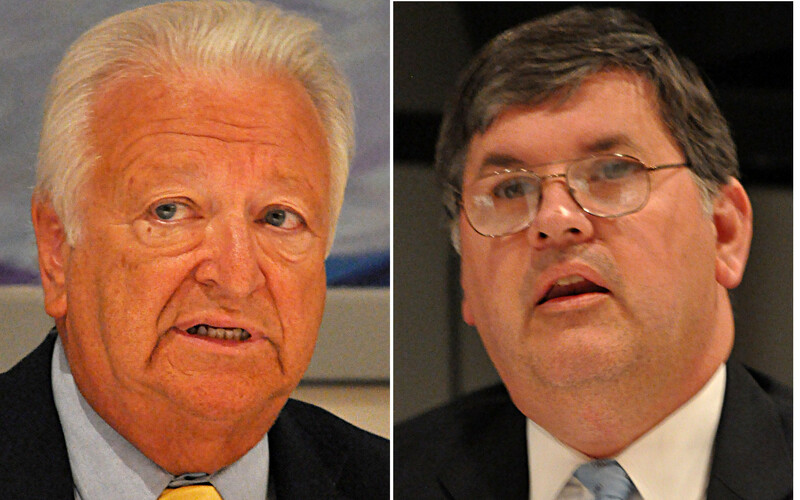 NORWALK, Conn. – A pointed disagreement at Tuesday night’s Common Council meeting pitted Democratic mayoral hopeful Matt Miklave (D-District A) against Mayor Richard Moccia in a rare direct, face-to-face exchange between the incumbent and a challenger. Moccia, who has said he will not engage his Democratic opponents until after his general election challenger is chosen in the Sept. 10 primary, took exception to criticism from Miklave over what the councilman called a lack of ordinance enforcement by the Moccia administration. Talk to the state legislature, Moccia said. Miklave first wandered off into critical territory when he questioned whether the blight ordinance that was being discussed would ever be updated or “tweaked,” as other council members said it should be. That hasn’t happened with the ethics ordinance passed in 2007, Miklave said. No reaction on that one. Miklave then went on to echo comments made by Councilman Fred Bondi (R-At Large), regarding the eyesores created by commercial properties. Moccia didn’t miss a beat. The city has had cases in court for years, “because they fit them in when they can,” Moccia said. There are probably about 200 cases in court at the moment, Moccia said. The mayor had the last word on the topic. While there was no debate at the meeting, Miklave did answer an email afterward asking if he had anything else to say. Looks like Mr. Miklave hit a nerve there. His plan to implement Performance Based Budgeting to free up valuable tax revenues to tackle long standing problems that this administratiion just shrugs at is the only plan that proposes solutions along with the resources to get the job done. A search indicates that NYC, a much larger beat to monitor and enforce code violations, does not have a separate zoning court or docket for code violations. They seem to administer these enforcement efforts robustly through their Department of Buildings before using courts as the last resort. Perhaps having a Mayor with more experience in the law will help devise strategies for getting those cases moved along. Don’t Panic: This is not NYC nor is it New York. Connecticut has a process that must be followed and the city is powerless to change that process. Once a cease and desist order is issued, the matter goes to the court – period, the end. The Mayor is right, these cases take years to adjudicate. It is easy for the “I have a plan man” Miklave to publically make untrue comments because he doesn’t have a clue about the law when it comes to these kinds of things – kind of sad for an Officer of the Court – certainly not Mayoral. I stand corrected about the legal process. Please don’t attribute my misunderstanding of the law to Mr. Miklave. He quite ably speaks for himself and is a lawyer, whereas I am not. Is there room for additional code enforcement options PRIOR to a cease and desist? The City seemed to have no problem passing a blight ordinance last night that allows the city to perform repairs on a residential property without the owners consent and to saddle them with the costs of that repair via the tax collection system which can ultimately lead to seizure of the property. I am curious as to why the rules might not allow for similar treatment of commercial owners. Looks like Miklave called Moccia on the carpet and made him look like a fool. The only answer Moccia seemed to have is yet more excuses for his failed administration. Every process such as this must include a method of appeal and ultimately, must proceed through the court system. If the city repairs the personal property of a resident, they must file a lien against the property. Again, the owner has a right of appeal. These things do not occur within a week, or a month, and sometimes take a year or more. Also, who repairs or cleans up the property (city workers – outside vendors?) and who pays for those costs while this is appealed? You, the taxpayer, that’s who. I was just saying that in regards to the issues raised by Miklave and Moccia, Moccia was right and Miklave, being a lawyer, should have known the process. He probably did but was using the soap box for his campaign. After all, he got coverage didn’t he. Do you think for a second that the budget submitted for the police dept is what Harry wanted, with no direct orders from the mayor ? By the time any part of that budget request is available to the public, the mayor has had his say in private. Now, during the campaign season, we hear the mayor wants to add police manpower. Old timer it just took 48 hours to admit to a shooting in Norwalk. I’m under the impression in 09 Harry gave back the money out of his budget by the way the reporter wrote it. A $469,000 budget cut that will reduce patrol, community police and the vice and drug squad will not affect service, Chief Harry Rilling said Friday.